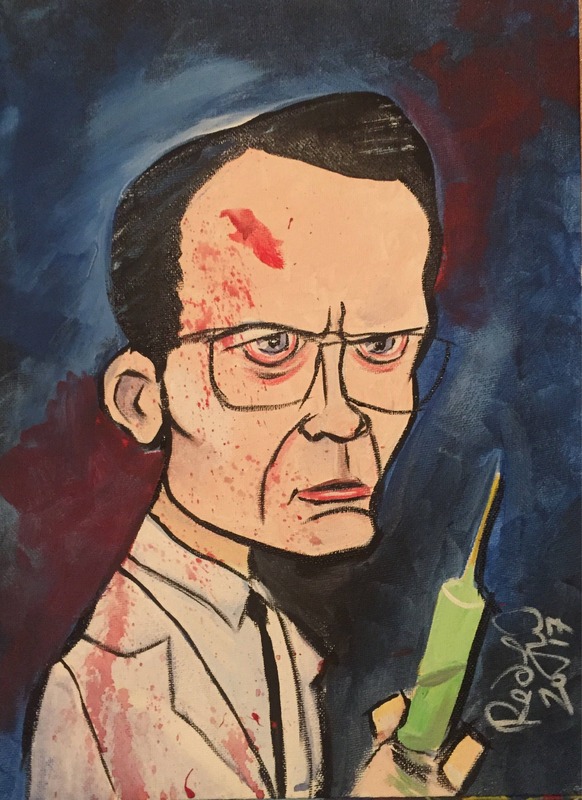 HERBERT WEST, REANIMATOR (2017) by Mark Redfield. This cartoon is an original acrylic painting on stretched canvas and not a print or reproduction. It is sold unframed. Sold in the U.S. only. FREE SHIPPING THE US FOR THIS PAINTING. Please note : Etsy/Patterns is now adding sales tax. Commissions are welcome! Contact the artist! Thanks for visiting and your patronage! Your support is greatly appreciated! Please come back soon. For purchases within the United States, I accept PayPal (which is the easiest for you to use). Please make sure that your address (where to ship the item you purchased) is correct. Usually your order will be shipped three business days from the processing of the PayPal payment. In the United States, I also accept checks or money orders. Please allow FIVE business days for your check to arrive, process and clear, before shipment. Check or money order (made payable to 'Mark Redfield') should be sent to: Mark Redfield, P.O. Box 19428, Baltimore, Maryland, 21206. For orders or inquires OUTSIDE the United States, please contact me by e-mail, at actormarkredfield@gmail.com and please include all of your pertinent shipping info, including accurate address and postal code. Within the United States, shipping and handling costs are usually added to each item. The cost is based on the materials used to protect the work, and each piece is carefully hand-packed by either myself or an assistant. Within the US, each piece is shipped via the United States Postal Service, and tracking information, delivery confirmation and insurance are used when and where applicable. For inquires and orders OUTSIDE the United States, please contact us for rates, etc. Sorry, there are no refunds or exchanges for any reason. Prompt processing and shipment of your item: please be aware that sometimes an actor's life and schedule can be a bit crazy, especially with travel and long hours on the set! Be assured that your item will be processed as quickly as possible. In the event that I am "on-set" in some far off location, or am traveling, you will be notified of any minor delay. I'm fortunate that I have great assistance with getting your item out to you in a timely manner! Thanks! Copyright: All of the works sold here are copyright Mark Redfield, and the purchase of any item(s) does not grant the purchaser any copy rights whatsoever, including, but not limited to, the right of reproduction. Should you wish to license reproduction rights, please contact us.